Minecart Mayhem is a Bonus Stage found in the game Donkey Kong 64. After the player jumps in the Bonus Barrel, they can play this game to try and win a Golden Banana. In this minigame, the player will need to avoid hitting any carts carrying TNT Barrels while moving in a minecart on the stage. The stage is formed of four tracks, each two connected with two conjunctions. 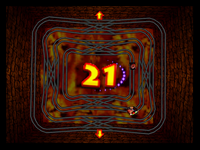 The TNT cart(s) will try to move onto the same track the player is on whenever possible, so the player will need to change tracks using to survive. The player can speed up using , and slow down using . If a TNT cart hits the player, they will lose and will have to repeat the minigame. Once the set amount of time is over, the TNT cart(s) will explode, and the player will be awarded with a Golden Banana. Avoid the TNT carts! To speed up, press To slow down, press To change lines, use at any junction. Good luck! This is one of only three minigames in Donkey Kong 64 to not use the bonus stage theme used by all other minigames, the others being Stealthy Snoop and Mad Maze Maul. It instead has its own unique music track. This page was last edited on August 18, 2018, at 09:55.